Poland declared today it understands the U.S. security concerns with Iran, and will support the U.S. position in Brussels, helping to facilitate dialogue between the two positions. Prime Minister Mateusz Morawiecki said Tuesday that Poland wants to be an “informal go-between” and to explain to EU members and U.S. officials the positions of the other. 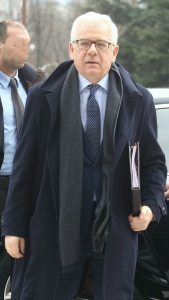 Polish Foreign Minister Jacek Czaputowicz said Monday during a visit to Washington that Poland stands with the rest of the EU in seeking actions to limit economic damage from the Trump administration’s move, “while as for the strategic and security dimension, we also understand the U.S. concerns,” reported Associated Press. The Polish government has not hesitated to confront the EU leadership on a variety of subjects including judicial reform, migration, and open borders. After financial sanctions were pushed forward in the EU Parliament against the Central European nation, Poland has eased somewhat on the facets of its judicial reform, which the EU declared ‘authoritarian’. The conservative countries of the Visegrad Group of nations receive financial and humanitarian benefits from being in the EU but chaff under the socialist, progressive policies dictated from Brussels.